Thank goodness for London’s late night openings. If it wasn’t for them we’re sure half the working population would be forever devoid of culture and community, starved of inspiration as the weekends become saturated, sacrificed to the gods of laundry, grocery shopping and petty squabbling over DIY. Great news for the team from Conran that kept missing the now annual graphic arts and illustration fair, Pick Me Up, at Somerset House when we managed to get down there for the late night opening (until 10pm!) yesterday night. 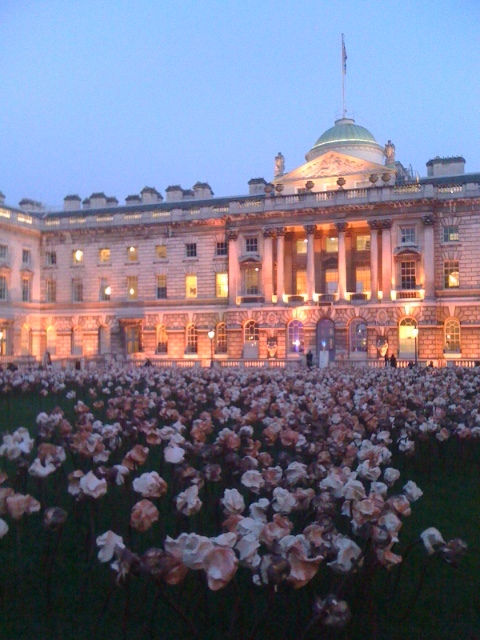 Inspiration and creativity with the added bonus of a beer at the end of a sunny but busy Thursday in the spectacular courtyard surroundings of Somerset House, the new installation of ceramic flowers Out of Sync by by Fernando Casasempere spread out before us. 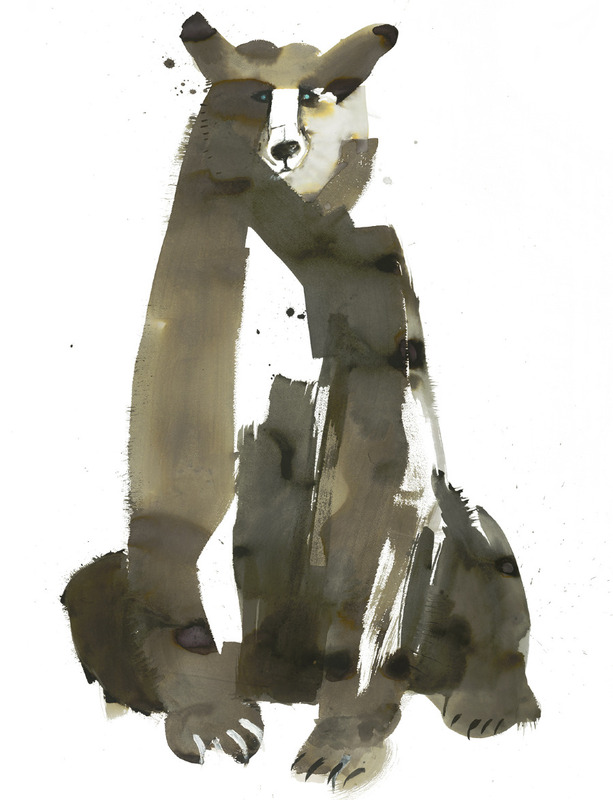 A particular favourite of the team was this wonderful, almost life size Bear by Sarah Maycock., generous sweepings of washed colour and beautiful economy of line. 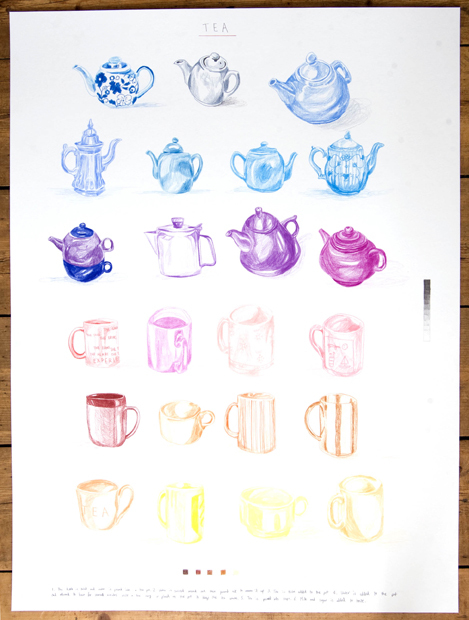 Others were David Sparshott’s illustrations, particularly the bicycles and these teapots executed simply using graphite and coloured pencil. 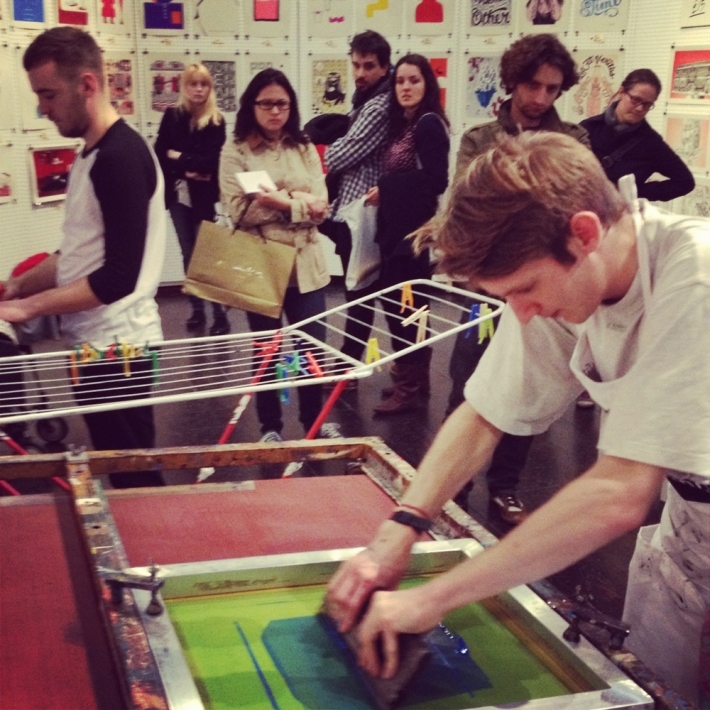 It was great to see screen-printing in action at Print Club London with a wide variety of prints on sale. It’s on until 1st April, leave the laundry on hold and get down there while you can. A little after-school activity report today from Nathan Zaver, one of our interior designers from our Conran & Partners office down in Brighton. We’re a busy lot on the south coast it has to be said, designing secret houses, saving lidos and giving old icons a new lease of life so it comes as no surprise that we’ve got our fingers in a theatrical pie this time! Over the last few months I have been collaborating with Tristan Sharpe of Dream Think Speak on the Interior Design of the their next production which will be their working of William Shakespeare’s Hamlet. It’s been really good fun working on this, especially as it’s a new experience designing set’s for a complex imagining. I’ve really enjoyed working on it and can’t wait to see it built and to see the production! THE REST IS SILENCE interweaves performance and film to create a vigorous new interpretation that explores the messy underbelly of Shakespeare’s great play. 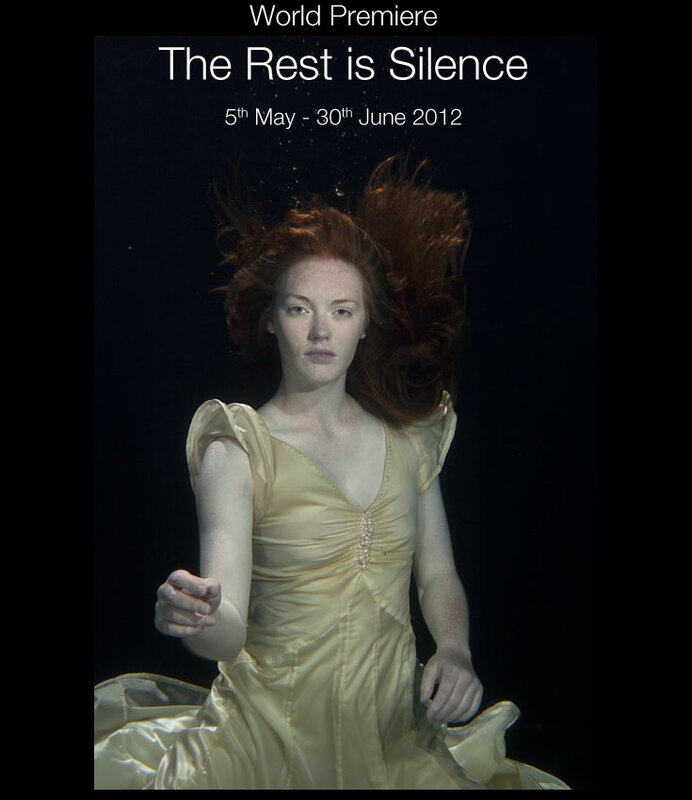 Studios as part of LIFT 2012 and then on to Northern Stage as part of the RSC Newcastle season. 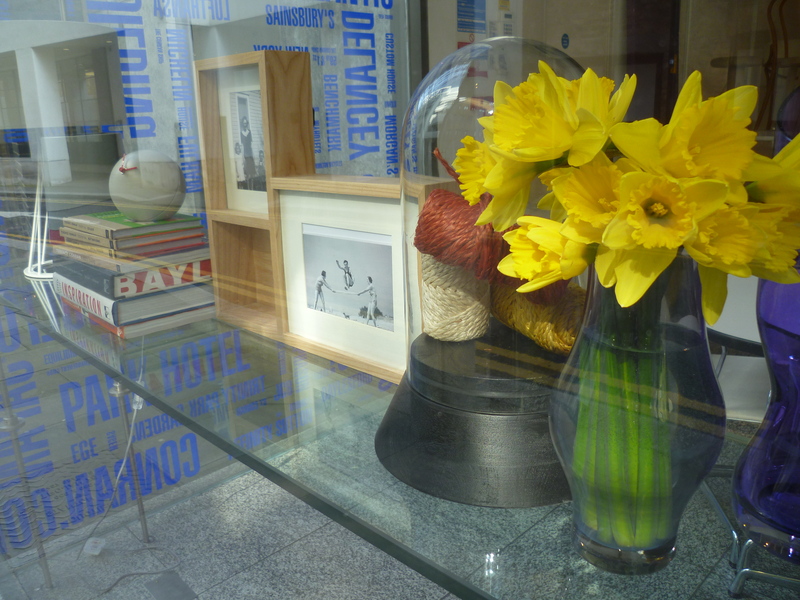 It’s Friday, the sun is shining and we are full of the joys of spring – as is our current window display! 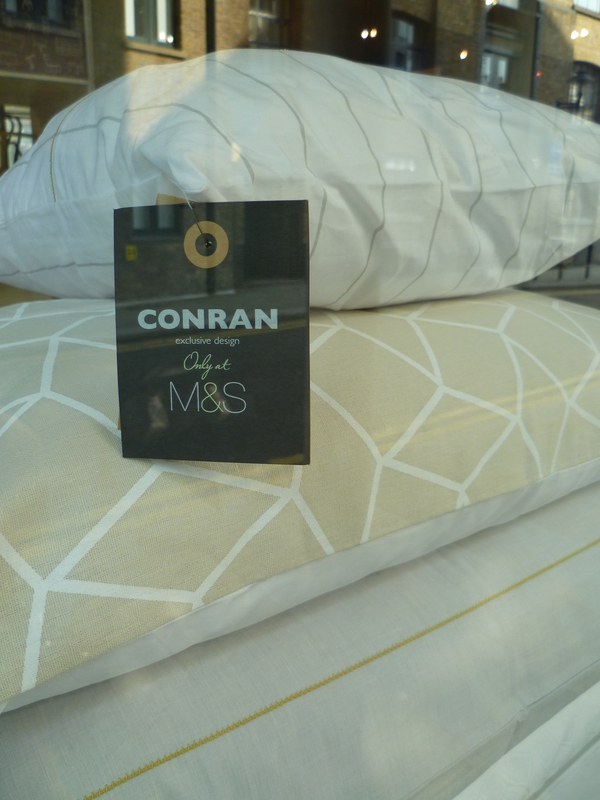 The products gracing the glass shelves this month are from our M&S collaboration and are all new in for SS12. 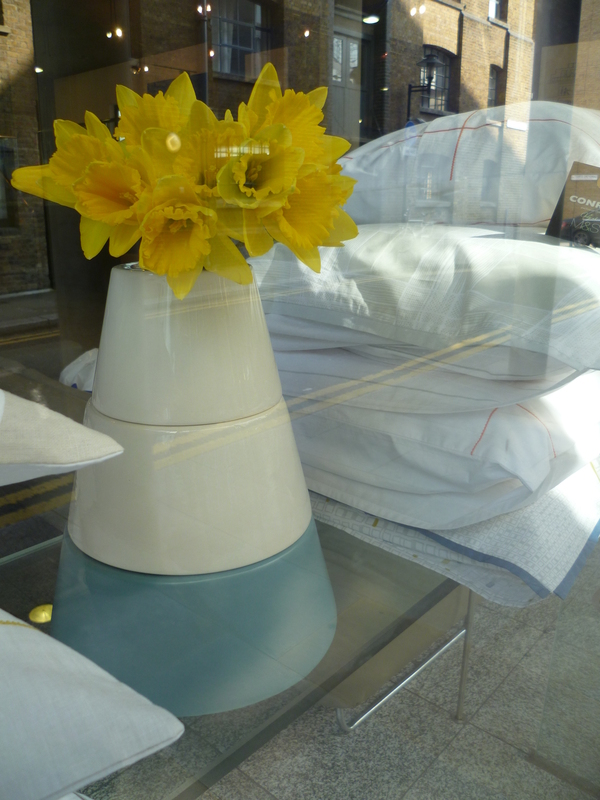 Among those gorgeous bunches of daffs are some of our bestselling cloches, cushions and our fabulous new bedlinen – nine fresh new designs for Spring. All are available online at Marks & Spencer. 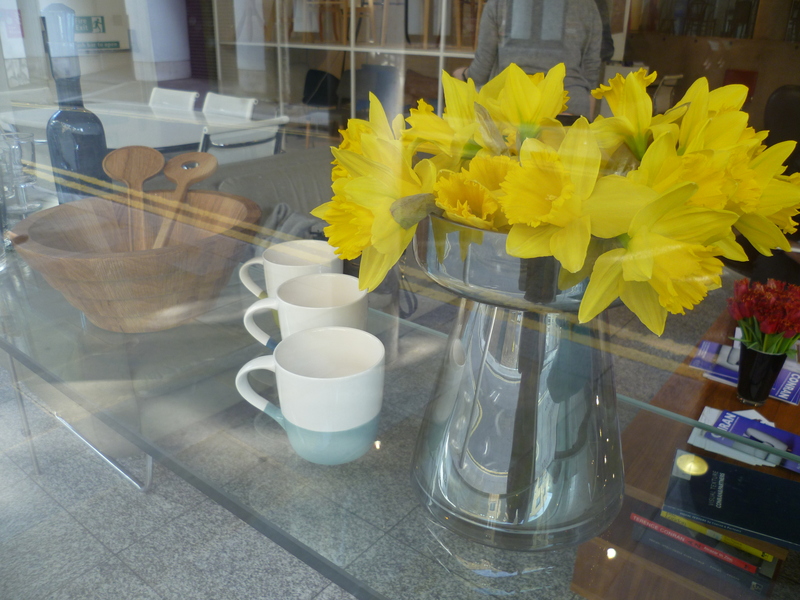 If you are in the area feel free to pop along to our office at 22 Shad Thames and have a look. Terence’s exhibition is still on around the corner at the Design Museum so come and have a browse afterwards! 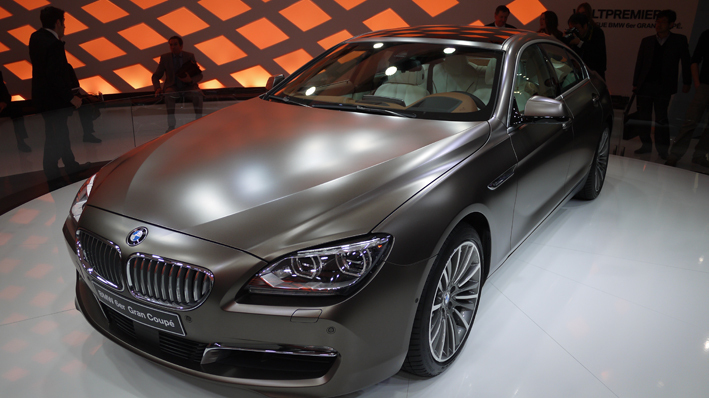 “Mesdames, messieurs…” welcome to the 82nd Geneva motor show, the circus has come to town. Conran Studio were there too to view the spectacle. Enormous show halls are filled with automotive beasts corralled into brand paddocks, each of these stands are themselves magnificent pavilions of grand architecture. The lights, noise and static crackle and we dehydrate to a crisp on entry. 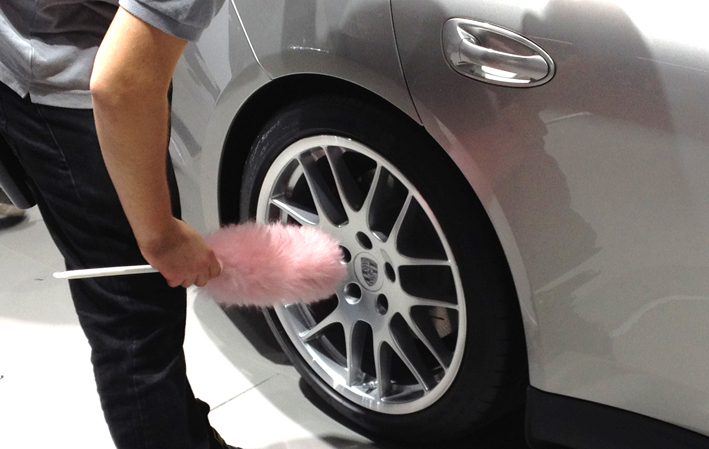 Serious men with pink feather dusters tickle the final specks of dust from their show pieces. Hired women with skinny curves stroke their tamed metal brutes. Despite the elephant in the room, a herd of them in fact – the finite oil supply, planning of car-less mega cities, markets emerging in unpredictable ways and a general global skint-ness – the first impression was of business as usual. All the biggies – Audi, Toyota, Peugeot, BMW, Mercedes, Ford, Volvo – have voluptuous spaces for photogenic concept launches. There are plenty of both cars, ideas and determination to delight. Colour is everything this year. The recent, subversive resurgence of matt charcoal blacks for exterior finishes have become Prada-fied, via the sweet shop: silky caramels, powdery, matt hint of strawberry, fresh pale, pearly mints. Sophisticated, modern and with a (stroppy) edge. 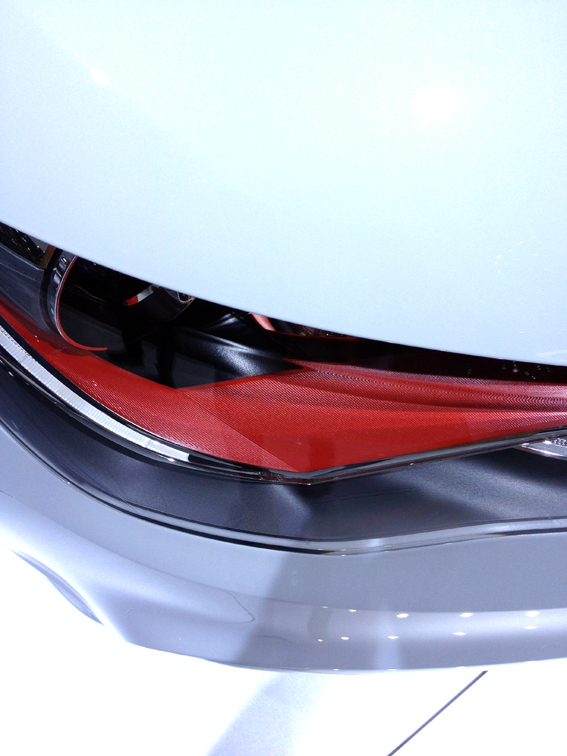 Graphic flicks and accents are bold and executed with flair, look at the red-eye of the Audi A1. Form. The tribal nature of car brands cause a powerful kinship for consumers, the silhouettes of these cars are a masterclass in creating emotional connection through design. The sinews, scoops and flex of these muscled creatures look particularly good when you lie on the floor; so look up next time you’re being run over. The language is still diluted for the newer brands such as India based Tata, but they’re gaining momentum and confidence and an evolved language is sure to follow. Lighting. Developments in technology and manufacturing techniques have allowed for softer and more controllable lighting in interiors. (Remember when it was a slide plastic thing that rarely worked and god-forbid if you turned it on whist Dad was driving?). On the outside, lights are swept back, arched, looming, scowling… every brand has a different twinkle to its eye, the eyes being the door to this soul. Interiors. The knobs and dials are interactive jewels, causing an intimate dialogue between the drivers’ eyes and hands. 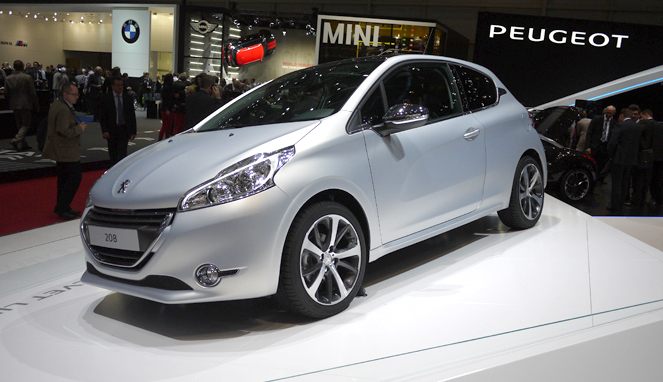 The new Peugeot 208 exemplifies this more direct experience, for example the teeny steering wheel and a clever composition means you see the instruments above the wheel rather than peering through. The references to a broader design world are clear to see: bespoke tailoring and expert pattern cutting, combinations of textures and fabrics and stitched seam details, precision craft of cabinetry and the intersection of materials. A crossover with other trades for design and materials is nothing new (the partnership Ferrari, Poltrona Frau and balsamic vinegar, anyone?) but making these designer cues blatant to the consumer eye is evident for many manufacturers. 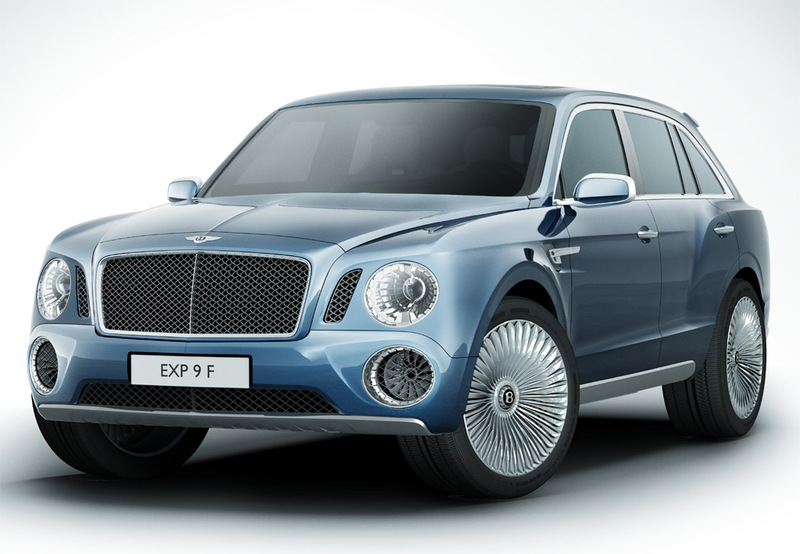 One extraordinary sight was of the new Bentley EXP 9F. With wheels the height of thighs, a bullion of rock star alchemy, pleated leather tail gate and Lalique picnic set, surely this is the mark that the SUV set has finally turned the curve and will hopefully meet with steady demise? Yet futurism is here. Subtle, transcending and important shifts start to show the way ahead. 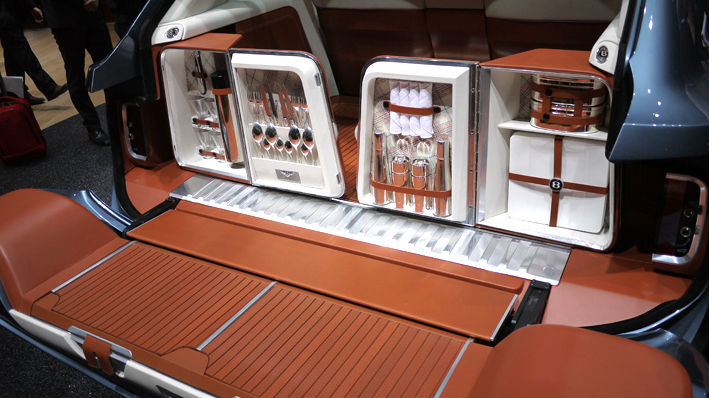 Starting with the back seat; the influence, particularly from China, is that the important people sit here. It could be that the head of the house is driven by their son or chauffeur or simply the car as a symbol of status where there’s no detail to compromise. For many generations it was a mostly wipe-clean area then came the nodding dogs and head rests. 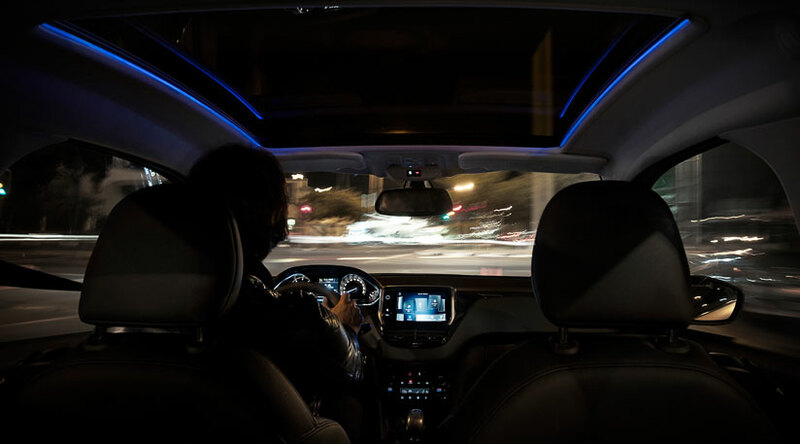 Now the focus is to be more comfortable and more interactive, brought to bear through lighting, ergonomics, layout and combinations of materials, your space personalised as you sit in the global traffic jam. Epiphany for me? Electric cars look – for the first time – both attractive and relevant. Our internationally-acclaimed architecture and design practice Conran and Partners has been signed up to create one of the leading residential resort destinations in Tuscany. We have unveiled our vision for the new estate in the heart of one of Europe’s most desirable locations and are now working on the masterplan to turn that vision into reality. The Il Ciocco estate, 40km north of Lucca and an hour from Pisa Airport, has been carefully managed by the Marcucci family since 1949. The family has a long history in the Valle del Serchio, with their pharmaceutical business establishing its headquarters here. An existing hotel is being refurbished, upgraded and rebranded as the Renaissance Tuscany Il Ciocco Resort & Spa. This project is expected to be completed for the summer 2012 and will see Il Ciocco become one of the leading hotel resorts in Tuscany. 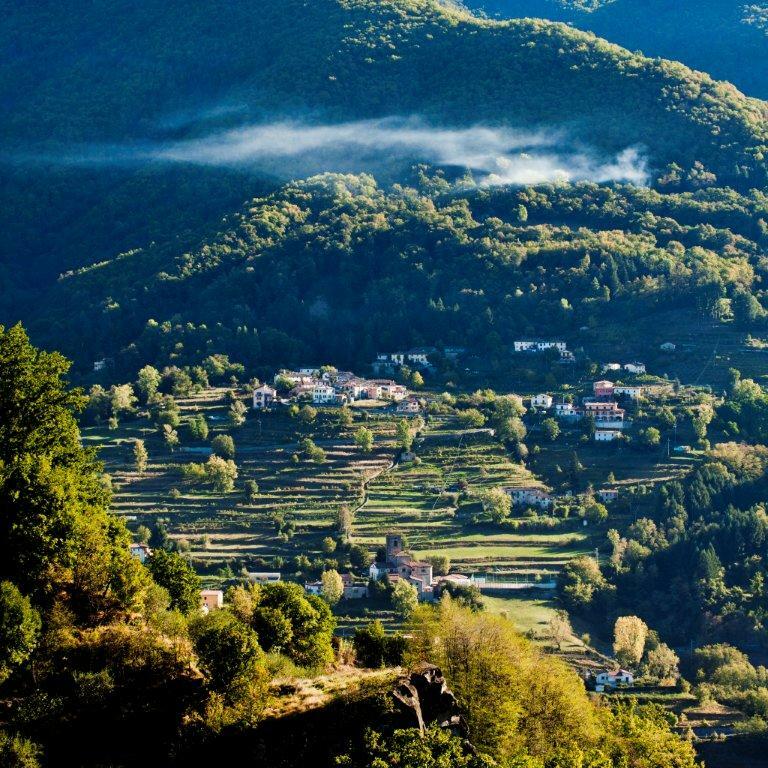 Our vision emphasises the importance of the landscape of Il Ciocco and ensures the estate works as a whole. The plans will see a new community on the west-facing 700 hectare estate with around 100 houses, a potential retreat hotel on the summit of the estate, a locanda, or inn, with rooms and community and leisure facilities. The homes will be a mixture of renovated traditional Tuscan buildings together with new-build houses sympathetic to the surroundings. We have a great track record in the restoration of historic buildings; giving them a new sense of purpose and successfully integrating modern design into older architectural styles. 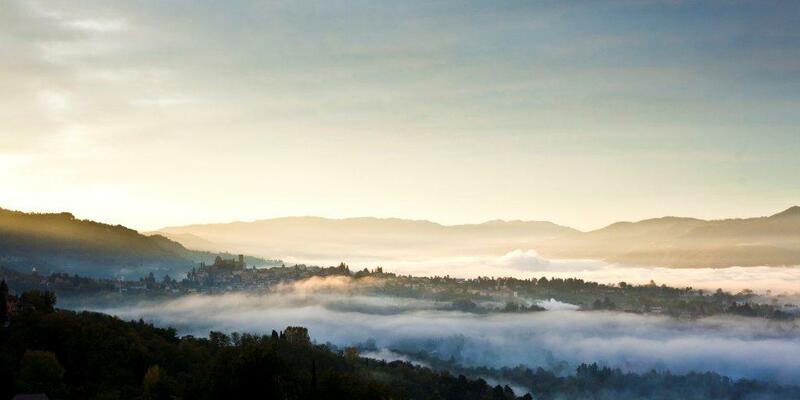 “The vision is to transform Il Ciocco into a one of the leading hotel resorts in Tuscany, while retaining and enhancing its place in the heart of the existing community. Conran and Partners has a portfolio of work that gives us the experience and expertise to turn that vision into reality. 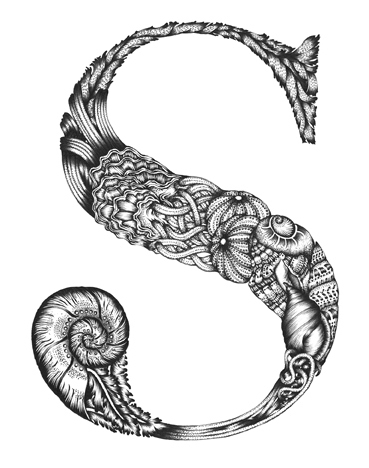 We are a London-based design studio with an international perspective and reputation. Working closely with the Marcucci family and Knight Frank we know we can create something truly beautiful and inspiring. Il Ciocco will be entirely Tuscan and will appeal to people who understand the beauty and the quality of life in this region of Italy. But it will also bear the hallmark of the Conran design ethos which has proved so successful on large-scale mixed use developments from London to Tokyo to India and Asia. All that remains to be said now is when do we get to go?! 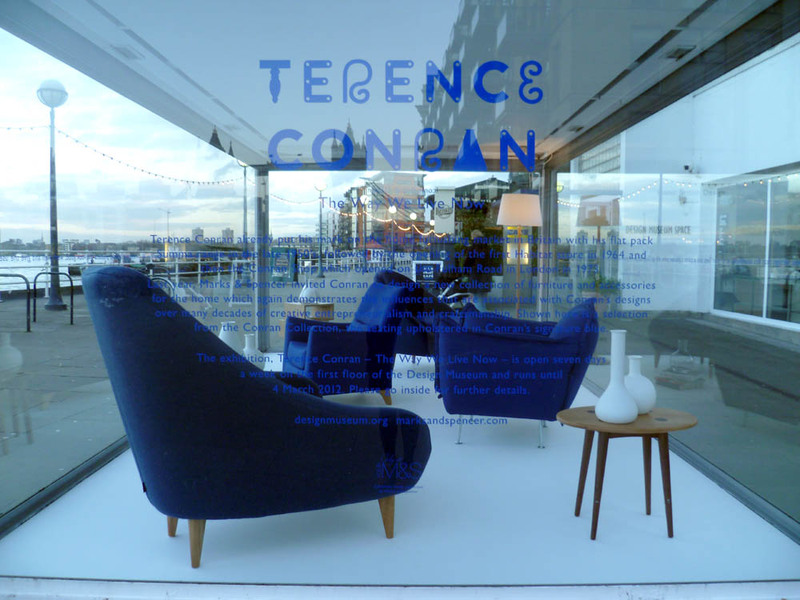 If you haven’t yet visited the Terence Conran exhibition at the Design Museum yet what have you been waiting for? The great news is the exhibition which was due to finish this coming week has now been extended, by popular demand, until the 12th April. However it is your last chance to see our fab foursome – a selection of bestselling Conran-designed chairs for M&S outside in the Design Museum tank. 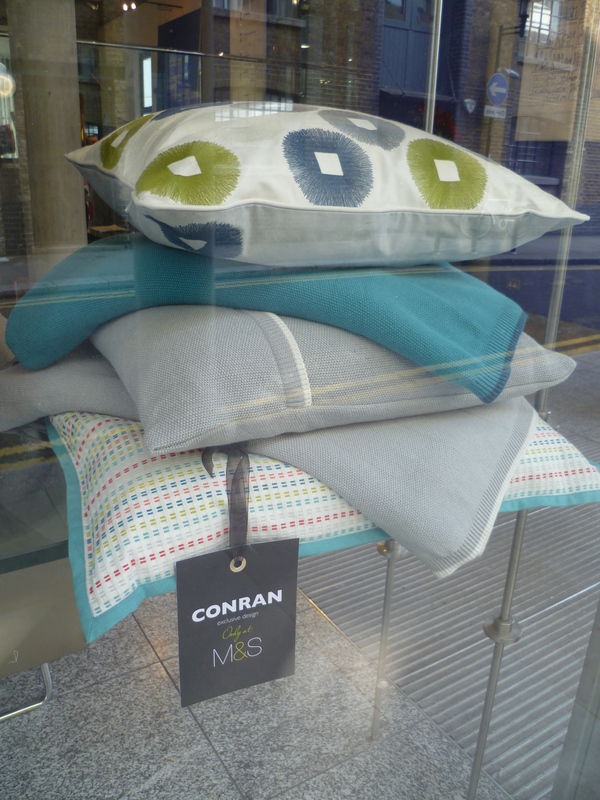 Specially upholstered for the exhibition in our trademark Conran Blue and accessorised with Conran for M&S vases and Terence’s books this little capsule display is quite the essence of Conran. And what a location.